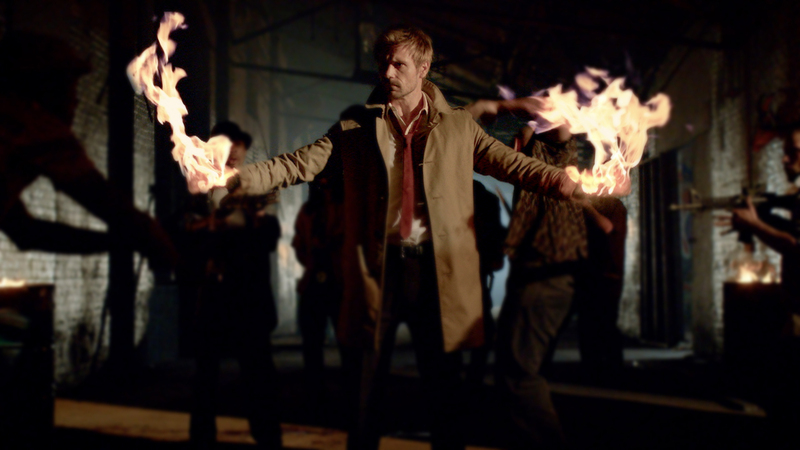 Last weekend NBC announced that it would stop production of their new supernatural drama Constantine. The first season of the show will consist of 13 episodes [no more, no less]; and, although it is not “officially cancelled”, that’s what most are assuming at this point. First of all, I have NOT watched the show. So I have no idea of whether it is awesome or awful. I probably wouldn’t love it since it is a genre I don’t normally enjoy. I don’t watch Supernatural, Dominion or Grimm, not even The Walking Dead [and believe me I’ve tried]. Not be my cup of tea, but that’s not to say those shows shouldn’t exist. By all means, I think supernatural/horror shows should be allowed to live [for many years] in their own little niche. This morning I tweeted out my support to #Constantine fans. Instantly, I got quite a few replies informing me that the show is well-loved and that #SaveConstantine campaign is in the works. Why would I feel compelled to support a show I don’t even watch? Well… it is more about supporting the fans and opposing outdated network programming tactics. Deciding the fate of a show after it has only aired 4 episodes [and on Fridays] seems premature to say the least. Sadly, this does not surprise me. Networks do this all the time! On the contrary, cable channels tend to have more faith on their shows and give them time to grow. That’s why AMC just renewed the low rated Halt & Catch Fire and why Breaking Bad became a hit of major proportions. But it is not just about network programmers crushing the fans’ TV-loving hearts; it is also about the entertainment reporters who love to quickly say the “obvious” and proclaim shows “dead”, even before any official announcements are made. I understand enough about ratings and media economics to know some shows are beyond salvation. No matter how much they try, Netflix is not going to pick up Star-crossed, Almost Human is gone forever and moving Smash to Saturday nights was a pretty clear message. However… there is hope for other shows, more than there was before. Just a few days ago Netflix resurrected Longmire and before that, there was The Killing. Why these shows and not… say Star-crossed? I would assume it has to do with branding. Judging from Netflix’s originals (House of Cards, Orange is the New Black and LilyHammer), it is clear they are going for an AMC/HBO type of programming. The Killing and Longmire fit that description and had a large enough audience to attract new subscribers. Meanwhile, Amazon resurrected the British show Ripper Street and even picked up Crossing Lines after it had aired only ONE season. [Amazon seems to be to going after European markets for some reason]. In addition, Community got its coveted sixth season [#SixSeasonsandaMovie!] thanks to YahooTV. Finally, let’s not forget that “no official decision has been made” sometimes means that NO OFFICIAL DECISION HAS BEEN MADE! So… even if all the cancellation/renewal sites are calling hopeful fans delusional, we simply can’t know until the network announces it. Yes, ratings matter, but more than ever, other variables matter too; mainly fan engagement and potential for online revenue, both of which are HIGH for cult-hits. A few examples: Hannibal is still hanging in there with 13 episode seasons. This show was left in limbo for several months after its first season, but NBC saw the light and renewed it [Thank God because it is a MASTERPIECE]. Beauty and the Beast was taken off the fall schedule last year with the remaining episodes to be “burned off” during the summer. There wasn’t one single critic or reporter that thought that show was going to get a third season but fans never gave up. They used their forced hiatus to campaign as hard as they could, won a PCA, inundated the CW with roses and raised 10,000 USD + for charity among other things. And… a third season is being produced [and yes, I still think a 4th is a strong possibility]. So… to all the Constantine fans out there and fans of other brutally mistreated shows I tell you: Even TV has underdogs… so just hang in there. Thank you for mentioning our show Beauty & the Beast,we dearly love this show,our cast & crew are the best,very dedicated & fun loving people.We Beasties as we call ourselves are very busy Voting our little fingers off for our amazing series for a repeat of a win for 3 years in a row for the PCA awards.We are strong in numbers & we like to ROAR!!! Well beasties definitely know how to roar, keep at it!